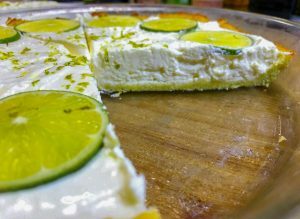 Looking for a simple low carb dessert with some class? 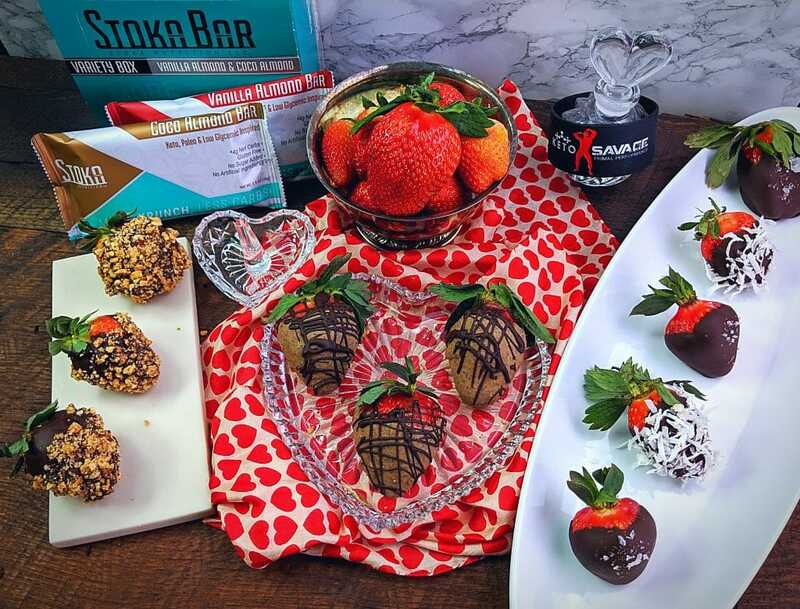 These keto chocolate covered strawberries will impress the one you love this Valentine’s Day. I need a dessert to make for Valentines Day and I don’t want to bake…help! 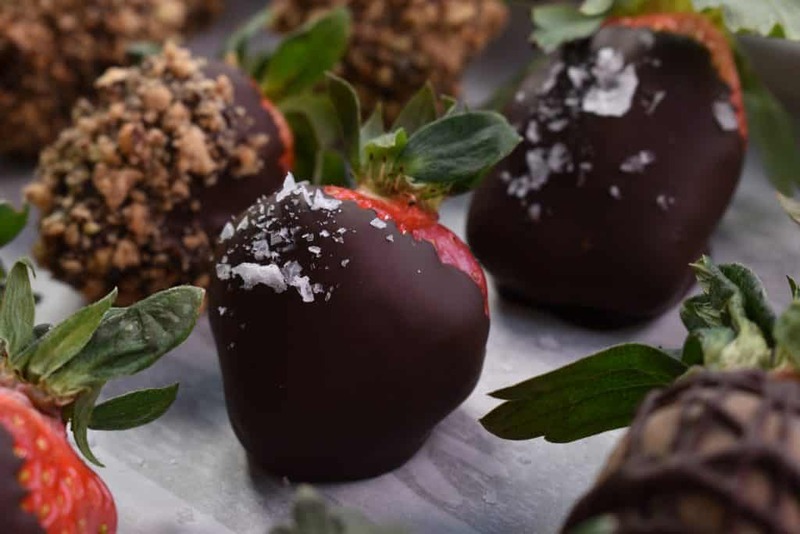 Don’t worry, follow a few simple instructions along with the video below and you’ll be a chocolate covered strawberry making machine. Now that is officially February Valentine’s Day is on the horizon so I thought it would only be fitting that we make a sweet treat for the one you love. Even typing that sounded cheesy but I digress. 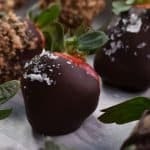 Chocolate covered Strawberries might be the most classic Valentines dessert I can think of and so I thought I’d show you four varieties that you can make in no time that will look just as good as the ones at a restaurant. 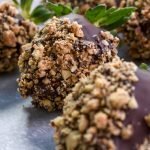 I used to dread making hundreds of chocolate covered strawberries when I worked as a prep cook in my younger days in the restaurant business. It’s a simple task that requires just a bit of patience and technique but it can get monotonous very quickly. Since we’re not making hundreds and there’s no mean chef yelling at us to hurry our asses up I feel that this will be a much more enjoyable experience. Strawberries are keto?? I’m calling the keto police right now!!! I don’t put up with weekend warrior keto cops, I just have to many other things in my life to have grown adults arguing about fruit. If you don’t feel that Strawberries can be part of a healthy lifestyle that’s cool, no hard feeling. I’ve got plenty of other recipes that I’m sure will fit your dietary needs. One extra large strawberry has about 1.5 net carbs, only 9 calories and has over 25% of your daily recommended vitamin C. As fruit goes it’s definitely on the lower end of the spectrum and has always been a personal favorite of mine. Now by no means am I endorsing you to shovel a dozen chocolate covered strawberries into your pie hole in one sitting. What I am saying is that 2 or possibly 3 of this would make for a perfect dessert (maybe with some fresh whipped cream) after a big juicy steak with some grilled asparagus topped with my Famous Madagascar sauce, Just saying. How do I keep the chocolate at the perfect consistency, mines always to thick or too thin. I used a full bar of 86% dark chocolate for these strawberries and there is a window that you need to be aware of when working with chocolate. 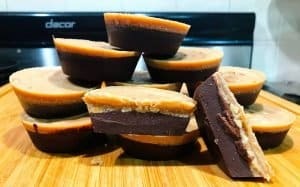 Since we want the chocolate to shatter when we bite into it instead of having a soft ganache texture we will not be adding heavy cream. Just chop up the chocolate into small even sized pieces and microwave for 30 seconds in a Pyrex measuring cup our bowl, then stir and repeat. One bar should only take about 60-90 seconds max. You don’t want to see it bubbling at all you just want the chocolate to melt smooth after just a few stirs of the spoon. The second part of the equation is having everything else ready to go. Have your sheet pan lined with parchment paper ready, have your strawberries washed rinsed and dried and have any topping you want to use ready to go. Once the chocolate comes out of the microwave it’s time to dunk some strawberries. Now as you go depending on how many strawberries you’re preparing the chocolate will cool and begin to cease up. Simply throw the chocolate back in the microwave for 15-20 seconds and go back to preparing the strawberries. What’s a keto brick? and stoka bar says what? Keto brick is a fairly new product from the Keto Savage and Crystal Love, two young Entrepreneurs and fitness experts in the keto community. The brick itself is a thousand calorie (brick) that basically has everything a growing keto boy (or girl) needs. They currently come in three flavors: original mocha, cookies and cream and cinnamon crunch. All three are fantastic and I highly recommend you check out their website. If you check out the keto brick Instagram account you’ll see all the cool ways people portion the brick out by melting it down and pouring into all different shapes molds, everything from cupcake to gummy bear molds. You can melt the keto bricks using the same 30 seconds intervals as the chocolate mentioned above. 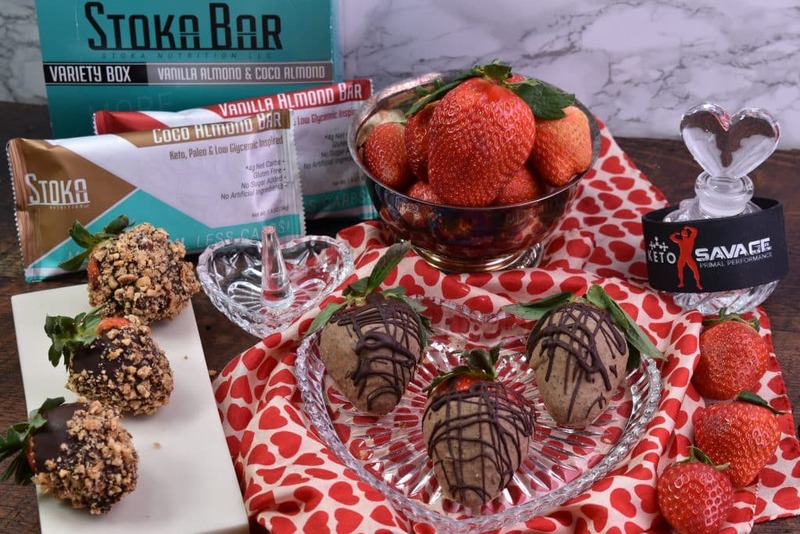 Stoka Bar is another fairly new company that I’ve fallen in love with. It’s a no grain gluten free low carb granola bar. If you miss the crunch of a hidden valley granola bar you will be in heaven when you try stoka bars, the currently come in two varieties. Coconut almond and vanilla almond. Both are outstanding. You can find them on amazon and they are eligible for prime shipping (high five) I’m looking forward to meeting up with both of these companies this summer in Austin at KetoCon. Ok, I feel good about this, any last tips before I start dipping Strawberries?? Sure, as I mentioned above, have all of your ingredients prepped and ready. Strawberries washed and definitely dried, the chocolate won’t stick to the strawberries if they are wet. Speaking of strawberries, if you are indeed buying strawberries close to Valentine’s Day you’ll hopefully find stem on Driscoll brand strawberries. They will cost a few extra bucks but they are well worth it in my opinion. The stem obviously helps keep you fingers clean and makes for a beautiful presentation. If you can’t find any Driscoll strawberries any will due but I figured I’d let you know what to look for. As far as dipping the strawberries themselves I use the dip and twist method. 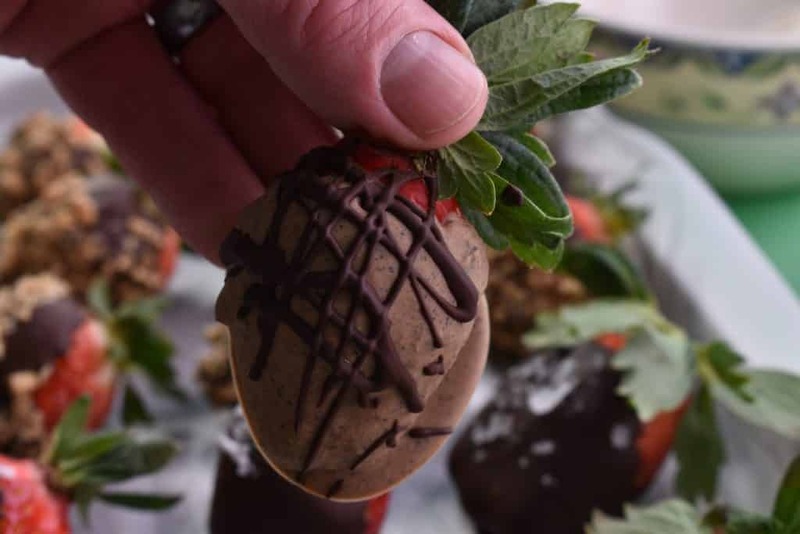 Dip the strawberries in the chocolate and coat all sides evenly leaving a little red showing for presentation, then let most of the excess chocolate drip off. Finally twist your wrist and point the strawberries to the sky and let chocolate evenly drip down just a bit before gently setting on the parchment paper. If you’ve done it correctly you’ll have very little chocolate pool up underneath the strawberry. After each step place the strawberries in the freezer for 10-15 minutes so the chocolate fully hardens. 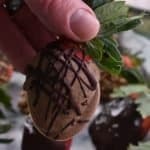 After a few dips you’ll be a pro and you can always trim off any excess chocolate with a paring knife so the strawberries look uniform yet unique. chocolate covered strawberries are like snowflakes no two are the same. Alright, I feel like I’ve given you everything you need to go and wow your valentine this year. These strawberries will be so good I bet you’ll be making them more than once a year. 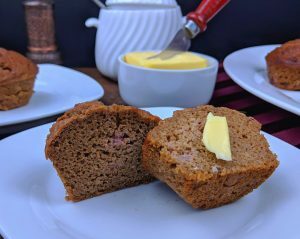 As always thanks for checking out my blog and I’d love for you to consider subscribing to my YouTube channel so you can keep up with all the new recipes coming out every week. Leave a comment below if you have any questions and I’ll try to get back to you as soon as possible. Crush the Stoka bar in a plastic bag then pour into a bowl. Dip strawberries in the chocolate about 3/4 of the way in then let excess chocolate drip off. then turn the point of the strawberry to the sky and let the chocolate cascade down. next gently roll the strawberries in the crushed Stoka bar. Then set strawberry on the parchment paper. Dip strawberries in the melted keto brick about 3/4 of the way in then let excess chocolate drip off. then turn the point of the strawberry to the sky and let the chocolate cascade down. Dip strawberries in the chocolate about 3/4 of the way in then let excess chocolate drip off. then turn the point of the strawberry to the sky and let the chocolate cascade down. 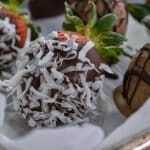 then roll strawberries in the shredded coconut.